A manufacturer of glass working torches, Bethlehem Burners had pivoted from targeting the industrial laboratory market to the glass working artist community. The company faced challenges including building brand awareness and overcoming the perception that their product was overpriced. SmartAcre set out to demonstrate the high quality of the product and turned to social media to enlist the help of the passionate artist community who, ultimately, would become Bethlehem Burner’s customers and biggest advocates. SmartAcre grew an engaged Facebook audience from 100 to 5,400 and counting through content and contests, including a 5% or better participation rate in Facebook contest campaigns. Client experienced a 76% increase in overall website traffic year-over-year upon initial launch of SmartAcre’s social media campaign. Within 6 months of launching the first campaign, SmartAcre delivered a 175% increase in online orders. Today the products are highly coveted and often require customers to pre-register for purchasing new products. The branding felt industrial (because it was) and was heavily focused on product specifications. After evaluating the market, SmartAcre came to two conclusions. First, the most interesting aspect of this industry is the art produced with the torches. Rarely does a carpenter’s hammer or an artist’s brush get admired. Showcasing the art that could be produced with the product was clearly going to be a big part of the strategy. Second, the best spokespeople for the products were going to be the artists themselves, who interacted largely on social media. The website redesign incorporated new product photography, video, and artwork from featured artists. SmartAcre also worked to create a mobile user-experience in addition to the desktop UX, both of which featured online ordering capabilities. In parallel with the website redesign, SmartAcre worked to produce new branding, photography, video, and content featuring product information, artists’ work, user reviews, and company news leveraged through social media, PR, and the client’s website. The new logo retained the traditional “BA” from the parent company and was designed to represent a quality, heavy duty, and reliable tool. SmartAcre provided alternative logos for use on the actual product as well. In order to create brand awareness within the targeted artist audience, an inbound marketing program was built around developing and leveraging content through email, product and company news, website content, and social media content. Customers regularly express interest to display their artwork, resulting in a steady flow of user-generated content. In order to target the artist community, SmartAcre developed a social media marketing strategy. Because it was determined that there was a growing market of artists that were utilizing social media, this strategy focused on platforms with high user-engagement such as Facebook, Twitter, Instagram, and Pinterest. To begin building a social media audience, SmartAcre launched a contest targeting glass working artists on Facebook. To kick off Bethlehem Burner’s social media marketing, the “Show Us Your Glass” contest launched, calling all artists to submit their work for the chance to win a torch. The results exceeded expectations and proved that the artist community was more than willing to share and listen through social media. A competitive analysis uncovered that competitors in this market offered a large number of torch models as well as many accessories, increasing expense. As a result, Bethlehem Burners combined torches, tips, and accessories into just three models. After careful keyword research, SmartAcre introduced an online visibility program consisting of PPC, SEO, and social media advertising. By leveraging content through email, industry verticals, social media, and landing pages, SmartAcre has continued to drive online visibility, online orders, and user engagement. In 2016, SmartAcre partnered with third-party logistics company, 3PL Central, to build out an integrated marketing program. As an extension of the 3PL Central marketing team, SmartAcre provides additional expertise and bandwidth to accelerate marketing ROI. SmartAcre helped the IBM Watson team accelerate account based marketing programs by providing lead and demand generation strategy and execution. SmartAcre collaborated with Maintenance Connection to accelerate their marketing campaigns and provide a deep understanding of their lead nurturing effectiveness. SmartAcre partnered with a niche accounts payable automation solution company to increase their lead volume and create sales opportunities during the first 30-60-90 days of the engagement. SmartAcre collaborated with 3PL Central in order to complete a website redesign. By creating a more user-centric website experience, 3PL central saw many improvements in lead and demand gen.
SmartAcre helped client, Exact MAX, automate and clearly designate lead status based on agreed upon definitions. 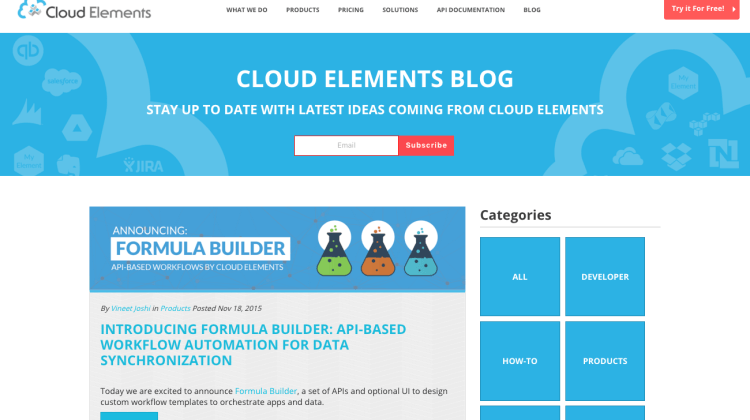 SmartAcre helped client, Cloud Elements, develop a piece of long-form content that resonated with their core audience, tech-savvy developers, but also powered their inbound marketing machine. SmartAcre helped IBM Watson with strategy and consulting, buildout of digital solutions, and managed campaigns with Silverpop marketing automation. SmartAcre helped Smartling develop and implement a scalable, enterprise-wide, custom solution to assess lead quality using HubSpot and Salesforce. SmartAcre helped a leader in vendor risk management and cyber threat intelligence analytics setup and launch a customized quoting process using Salesforce. SmartAcre helped BioDiscovery increase the demand for webinars by effectively managing campaigns through HubSpot and their webinar platform. AlchemyAPI worked with SmartAcre to develop a paid advertising plan to accelerate lead generation efforts in a three-month time frame. SmartAcre helped Cloud Elements develop a pre-launch eBook strategy using HubSpot, PPC, keyword research, social media content and crowdsourcing. SmartAcre worked with Cloud Elements to enhance their blog using HubSpot through responsive design, dynamic content and auto-publishing features. SmartAcre helped AlchemyAPI, an IBM Company, to accelerate lead and demand generation efforts by adding velocity to inbound marketing. With nearly ¼ of all Web traffic coming from mobile, Bangor Cork needed a responsive web design to improving user experience and conversion rates. LCTI needed a responsive website that would be a hub of information for students, parents, and staff members and appeal to audiences young and old. EIC needed a new website to better represent their brand and enhance user experience while supporting their growing mobile audience.